Pastor David T. Hawkins is our Pastor in Residence, he was born the youngest of eleven sons and one daughter. He received his undergraduate degree in Business Administration from the University of Missouri-Columbia and his Masters of Arts in Theology from Covenant Seminary. 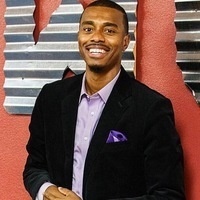 At the age of twenty-one Pastor David Hawkins accepted the call of Pastor at Living The Word Church Fellowship. In 1998 he took over as Pastor with two members and a bankrupt church. Through his dedication and Kingdom Focus, he has seen God grow the ministry to worshiping with over 600 people per weekend. He believes in Teamwork for the Kingdom and is known to make the work of God lots of fun. He enjoys sports and is an avid reader. His desire is to help create a place of worship where there is a felt difference in our love, our lives, and our worship.